An Inhuman mercenary who was recruited by the evil Mutant, Apocalypse, to be a member of The Dark Riders. It remains untold how Gauntlet came into Apocalypse’s services nor from which Inhuman group or society he hails from. Along with the Dark Riders, Gauntlet has also had affiliations with the Weapons Plus Program. Gauntlet had reptilian features and possessed enhanced strength, speed and agility. He has additionally been outfitted with several cybernetic enhancements that augment his skills as a fighter. As a member of the Dark Riders, Gauntlet acted as a hired killer for Apocalypse, advancing the mutant’s ‘survival of the fittest’ agenda. Gauntlet and the Dark Riders recently appeared in the pages of Uncanny X-Men, where they were trying to hunt and kill all Mutants who possess healing powers. Magneto led the Dark Riders to the abandoned isle if Geonosha. This was a trap Magneto had set and a series of explosions were detonated that engulfed all of Geonosha. Gauntlet and the other Dark Riders seemingly perished in the explosion. Although it is possible that Gauntlet may have somehow survived and will be seen from again some point in the future. A NuHuman whose transformation was caused by the Terrigen Cloud. Garza was a former S.H.I.E.L.D. technician whose transformation enabled her to generate powerful explosions of energized plasma. Garza was outfitted with a regulator suit by James Rhodes, and was appointed to the Secret Avengers by Maria Hill. Following her initial assignment, Garza resigned from the Avengers unit, unable to contend with the violence and stress of the job. Garza was placed in confinement by Director Hill until she could learn to better control her powers. Sarah has not been seen from in quite some time and her current status and whereabouts remain unknown. A young NuHuman whose Inhuman abilities were triggered by the Terrigen cloud. He was on holiday in America from Latverian when the Terrigen Bomb exploded and Terrigenesis endowed him with the ability to emit powerful bursts of energy. The transformation also caused his facial features to contort with numerous spike-like protrusions. The young man’s becoming an Inhuman proved a rich irony considering his bigoted and xenophobic attitudes toward Mutants. Shortly after his transformation, Geldhoff encountered Emma Frost and her students from the Xavier School. Unaware of the extent of Geldhoff’s new powers, Frost tried to intervene and help Geldhoff. He lashed out, releasing a concussive force wave that knocked out Emma Frost and the rest of her X-Men. Shortly thereafter, Geldhoff was approached by Monica Rappaccini and a group of rogue scientists from A.I.M. They managed to coerce Geldhoff to go with them and it remains unknown what ever became of him. An orange-skinned Inhuman with webbed hands and feet and large, bull-like horns. Ghaidor was a member of the Royal Guard who protected the throne room for the Royal Family. He manned the golden gong, which was sounded in the case of alarm, an impending threat. Ghaidor was struck down and killed by Blastaar of The Negative Zone who had come to Attilan to conquer the Inhumans at the behest of The Kree Empire. Ghaidor was avenged when Blastaar was defeated by Black Bolt and The Royal Family. An Inhuman who lived on Attilan and was scene celebrating at the wedding of Black Bolt and Medusa. A garrulous and boastful sort, Gitel claimed that he had once dated Medusa (though his friends appeared rather unconvinced of the legitimacy of the tale). It was Gitel’s sole appearance and his current status and whereabouts remain unknown. An Inhuman from the Marvel Cinematic Universe who has thus far only appeared on the television show, Agents of Shield. Giyera is a new Inhuman whose Terrigensis was facilitated by way of experimentation by the faction of the ATCU that had been controlled by Hydra. Loyal to Hydra, Giyera willingly participated in the experiment and Terrigenesis endowed him with the ability of telekinesis. Already a skilled assassin, Giyera learned to utilize his telekinetic powers to become a formidable combatant. A favored tactic entailed causing guns to float in the air and fire upon enemies, making Giyera something of a one-man-army. Giyera accompanied Gideon Malick to the ancient Hydra castle where Malick attempted to facilitate the return of the Inhuman, Hive, from its alien world prison. Giyera was rendered unconscious by an electrical blast from Lincoln. Later, a freed Lash went on a rampage, killing all the Inhumans that Malick had brought to the castle. Giyera was able to escape Lash and he helped Malick flee from the castle compound. During their escape, they came across Hive, who was now inhabiting the body of the recently deceased Grant Ward. Hive went on to become the new supreme leader of Hydra, supplanting and ultimately killing Gideon Malick. Giyera continued to serve Hydra as Hive’s second in command. Although it was later revealed that Giyera’s consciousness had been invaded upon and taken over by the microscopic parasites that made up Hive. In short, Hive had taken over Giyera’s will, as it had the other Inhumans recruited into Hydra. Giyera was later killed during Shield’s final battle with Hive. He was portrayed by actor Mark Dacascos. A hulking Inhuman that appears to be an enormous, humanoid pile of yellow goo. Glaboo possesses enhanced strength and durability as well as the ability to recompose his bodily integrity after sustaining significant damage. He can also stretch out his limbs for extended attacks, ensnaring opponents in the sticky, mud-like composition of his form. Glaboo was recruited into General Ator’s Crimson Cadre, a special branch of the Royal Guard commissioned by the Genetic Council and reserved for especially important missions. As a member of the Crimson Cadre, Glaboo battled the Fantastic Four and The Sub-Mariner during the Atlantis Rising event, before it came to light that the then Genetic Council had betrayed the citizens of Attilan. Glaboo returned to Attilan following these events and it is presumed that he continued to serve as a member of the Royal Guard. His current whereabouts following the fall of old Attilan during The Infinity Event remains unknown. An Inhuman adolescent who was evacuated from Attilan during the Infinity Event. She had passed through the door of Eldrac and transported to a rural area of Morocco. Some time later, exposure to the Terrigen Cloud caused her to go through Terrigenesis, transforming her into a slender humanoid with reflective, glass-like skin. She was additionally endowed with the superhuman ability to transform sand into intricate glass sculptures. Following her transformation, Glass Lass wandered the countryside until she came across a small village. She ended up abducted by some of the men in this village and forced to create sculptures that they would later sell to tourists in an adjacent village. Glass Lass’ whereabout where finally discovered by the other Inhumans and Nur led a team to rescue her. Nur, Naja and Isomer successful in this rescue and Glass Lass was returned safely to New Attilan. It is unknown whether or not she was reunited with her family and her current status additionally remains unrevealed. Rhonda Fleming. A latent Inhuman whose transformation was triggered when she was exposed to a sample of Terrigen Mist that she had studying. Dr. Fleming had been a researcher for Parker Industries and assigned to a project seeking to find a treatment or cure to the negative effects the Terrigen Cloud has been having on the earth’s Mutant population. Fleming was accidentally exposed to a sample of the Terrigen, it triggered her latent Inhuman genes, and her body was encased in a Terrigenic Cocoon. The villainous Inhuman, Lash, had been somehow made aware of the research at Parker Industries. He saw what had become of Dr. Fleming and attempted to abscond with the cocoon. Miguel O’Hera (the time displaced Spider-Man of the year 2099) had been serving as security at Parker Industries. He engaged Lash as the Inhuman tried to steal the cocoon. Lash attempted to teleport away and O’Hara was able to grab hold of him in time to all be transported. They ended up on the ridge of a volcano somewhere in South America. It was then that Fleming’s cocoon opened and she blasted out of it with awesome newfound powers. Fleming had been transformed into an angelic-looking being made of a living fire, with the ability to fly and emit beams from her hand that can teleport objects and persons wherever she pleases; as well as teleport herself in the same manner. Renaming herself ‘Glorianna,’ the young woman was struck near delusional by all that had happened to her. With her incurable new powers, she became convinced that she had been transformed into a god and set about finding a flock of worshippers to follow her. Spidey 2099 eventually tracks down Glorianna to a church were she has congregated a group of followers. Spider engaged Glorianna in a theological debate that quickly degenerated into physical battle. This battle ended when one of Glorianna’s wayward attacks inadvertently injured the woman who had been Rhonda’s girlfriend prior to her transformation. The shock of this was enough to cause Glorianna to break free of her delusion and she surrendered. She was taken in by the authorities and her current status and whereabout remain unknown. A latent Inhuman who gained his abilities following exposure to the Terrigen Cloud. Terrigenesis enabled Glow to grow and control bioluminescent algae. He can cause this algae to grow rapidly, covering wide areas. He can then have this algae generation a bioluminescent charge able to illuminate vast areas with a green hue. Glow is one of Karnak’s acolytes at the Tower of Wisdom, learning to hone his power while finding a sense of inner peace by way of Karnak’s particular philosophical outlook. A flying inhuman with orange skin, insect-like features, and a pair of short antennae. Glytra was a member of the royal guard and acted as a sentry, gliding over the skies of Attilan, mindful of any signs of trouble. When Attilan relocated from the mountaintop in Tibet to the Blue Area of The Moon, Glytra was charged with helping to usher the citizens of the city into safety bunkers. Once Attilan ultimate settled in its new location, Glytra was one of the first to emerge and survey the Inhuman’s new refuge on the moon. Glytra escaped with the others through the Door of Elldrac in the midst of the fall of Attilan during the Infinity Event. Her current whereabouts remains unknown. An Inhuman from the Marvel Cinematic Universe. Gordon has the ability to teleport over vast distances and create electromagnetic force fields. He has additionally devised a means of compensate for having been blinded by way of his process of Terrigenesis. Gordon was guided through his Terrigenesis and trained by his fellow Inhuman, Jiaying. Gordon went on to act as Jiaying’s confidant as well as a finder for a secret sect of Inhumans living in the sanctuary of Afterlife. Through a complicated series of events, the location of Afterlife was discovered by SHIELD who sought this sect of Inhumans out so to ‘index’ them on their catalog of super-human beings. Having been brutalized by Hydra in the past, Jiaying was supremely distrustful of organizations such as SHIELD and reluctant toward allowing her people to be ‘indexed’ in such a totalitarian fashion. Together with Gordon, Jiaying enacted a scheme to make it appear as though SHIELD had attacked Afterlife and attempted to assassinate her. This led to a violent confrontation where Gordon and the others took over the SHIELD aircraft carrier and attempted to expose all aboard to the Terrigen Mists (those who were Inhumans would survive and transform; those who were not would perish). Agent Coulson and his team intervened and put a stop to Jiaying’s plan. In the skirmish Gordon was mortally wounded when Agent Fitz swung a metal pipe into the space where Gordon had teleported into, empaling him with the pipe and killing him. What is possibly a 616 counterpart to Gordon was briefly shown in the backstory of Uncanny Inhumans #0. Here Gordon was an Inhuman criminal imprisoned in a pocket dimension by the King of Attilan who led some several centuries back. Although this version of Gordon looks similar to his MCU counterpart, it is unknown if he possesses the same powers. Gorgon Petragon, the second cousin to King Black Bolt and the son of Korath, the former king’s brother. Gorgon’s royal blood notwithstanding, he has remained something of a roughneck, much more at home at bars, brothels, and the battlefield than he is in the royal court. Exposed to the Terrigen Mist during his adolescence, Gorgon was transformed into a large, satyr-like hulk of a man, with greatly enhanced strength and durability as well as hoof-like feet that, when slammed down, can deliver devastating seismic waves. Gorgon was made King Black Bolt’s personal bodyguard. When Maximus seized control of the Inhuman crown, Gorgon opted to remain loyal to Black Bolt. Gorgon’s father was killed in Maximus’ coup and his mother, Milena, was held hostage. Maximus utilized Milena’s being his hostage as leverage that forced Gorgon to do the mad prince’s bidding. To this end, Gorgon was sent to the world of the humans to search out Medusa. Herein, Gorgon encountered the Fantastic Four. After an initial battle with these heroes, Gorgon, Medusa and the rest of Black Bolt’s Royal Court teamed up with the Fantastic Four and together they were able to defeat Maximus and reclaim the throne for Black Bolt. Gorgon went on to prove himself an invaluable member of the Royal Family, serving valiantly in battles against formidable foes, including The Mandarin, Maelstrom, The High Evolutionary, The Sphinx, Psycho-Man, The Hulk, and many others. He is by far the most headstrong and stubborn of the royal family; he never backs down from a fight and is by no means shy about speaking his mind, even in the presence of his king, Black Bolt. His loyalty to his king notwithstanding, there have been incidents where Gorgon has grossly defied royal decree… first when he helped his Queen escape to Earth so to save her unborn child, and a second time when he conspired with his best friend, Karnak, to once more utilize the sub-caste Alpha Primitives as slave laborers. Gorgon is additionally the most hedonistic among the Royal Family. He loves his drink and spends a good deal of time chasing potential bedmates. Although he is of high status within Inhuman society, it seems he often has rather poor luck in his romantic pursuits; likely a result of his frequently boorish conduct and the fact that he is something of a sloppy drunk. Gorgon has fathered two children, a daughter named Alecto and a young son named Petras. The mother or mothers of these children remain undisclosed. The relationship between Gorgon and his adolescent daughter has been quite turbulent and came to a head when Alecto ran off with her boyfriend, a young Alpha Primitive named Reyno. Highly bigoted toward the Alphas, Gorgon forbade his daughter from seeing Reyno and this led Alecto to flee with Reyno to Earth where they sought out amnesty with The Fantastic Four. Gorgon tracked them down and Reed Richards ultimately chose to return his daughter to Gorgon, deciding it was not his place to interfere. Alecto and Gorgon eventually made amends and Alecto broke things off with Reyno. The two young lovers later rekindled their relationship and went to live in a settlement Black Bolt had established where Inhumans and Alphas could live together in peace. It is unknown to what extent Gorgon still maintains a relationship with his daughter. Among his other duties, Gorgon is a head instructor in teaching the younger recruits of the Royal Guard. His students have included the winged Inhuman, Tonaja, the king’s son, Ahura, as well as his own daughter, Alecto. More recently, Gorgon has been put in charge of the training many of the NuHumans created by the detonation of the Terrigen Bomb. These new trainees include Flint, Naja, Iso, and Inferno. Gorgon and Inferno have established an especially tight bond and friendship based on their mutual love of heavy metal music. At the onset of the Silent War event, Gorgon led a mission to try to reattain a cache of stolen Terrigen Crystals. Gorgon was captured during this mission and an unscrupulous human scientist used Gorgon as a test subject to see what would happen were an Inhuman exposed to Terrigenesis a second time. This resulted in Gorgon being transformed into a beastly creature, even more savage and powerful than before. The effects of this secondary Terrigenesis either wore off or were undone by Inhuman science and Gorgon has since returned to his former physical self. Following the War of Kings event, when The Inhumans were temporarily made the lords over the Kree Empire, Gorgon served as the chief of security on the Kree planet of Kon-Tarr. Gorgon’s valor and hawkish views made him very popular among the Kree people… to such an extent that it caused friction between him and Queen Medusa, the then ruler of both the Inhumans and the Kree. Later, during the Infinity event, Gorgon became quite concerned that his young son, Petras, was ill-prepared for the oncoming threat posed by Thanos. He decided that Petras should be subjected to Terrigenesis prematurely, regardless of the fact that exposure to the Terrigen prior to adolescence entails a greater risk of unstable mutation. Gorgon’s cousin, Triton, tried to dissuade Gorgon of this course of action, but Gorgon refused to be swayed. Petras was exposed to the mists and it resulted in his being transformed into a minotaur-like being. Although Petras was endowed with greater strength and power, his transformation was sure to be viewed as monstrous by Inhuman standards… dooming Petras to a life of alienation among his peers. The population of Attilan were evacuated during The Infinity event, taken through the portal of Elldrac to many places unknown. Following the Inhumanity Event and the establishment of New Attilan, Petras and the other children had yet to be located and Gorgon was near hysterical with worry over the wellbeing and whereabouts of his children. Petra and many of the other children were eventually discovered and now reside on the Royal Inhuman Vehicle (RIV). Gorgon has maintained a close and longstanding friendship with his cousin, Karnak, despite the fact that the two are quite different in terms of temperament and interests. Gorgon and Karnak have been on many adventures together and have had a very close bond. After Karnak killed himself, Gorgon would not speak of the matter and it may have been that it was all simply too traumatic an issue for Gorgon to deal with… choosing instead to repress his feelings over the matter. Karnak later returned to life but he and Gorgon have yet to rekindle their close friendship. Just prior to the Secret Wars Event, Gorgon was critically wounded by the treacherous Inhuman, Lineage. Lineage shot Gorgon in the back, severely damaging his spinal column and leaving him paralyzed from the neck down. Although Inhuman medicine is quite advanced, it was unable to effectively treat Gorgon’s injury and he has been sequestered to a wheelchair. It has been an especially difficult challenge for Gorgon. He has always been a man of action, decisive and often impulsive; and not being able to move and act in the ways that he had been accustomed to has caused him great pain as well as a considerable self-reflection. Gorgon’s son, Petras, had been located alive and well, yet Gorgon has been not yet ready to see him, fearful of what it might be like for Petras to see his once mighty father laid so low. After more fully digesting the massive changes to his life, Gorgon has decided not to allow his injury cause him to simply wallow in suffering. He accepted Crystal’s invitation to join her ambassadorial team aboard the RIV and has redoubled his efforts to continue training the younger generation of Inhumans. The new Inhuman, Naja, has quickly become his prize pupil and he has also taken keen interests in enhancing the abilities of Flint, Grid, as well as the unwilling Inhuman recruit named Jack. Gorgon has been outfitted with a specialized wheelchair. It can act as a standard wheelchair, but can also transform into a type of bionic exo-suit that affords Gorgon greater mobility as well as a limited capacity to defend himself. The all new Team has recently recruited a new Inhuman named Panacea. Panacea possesses profound healing powers and it is unknown to what extent she has attempted to heal Gorgon’s spinal injury. In one scene, Panacea was shown using her powers on Gorgon… it was unclear if she was doing this with or without Gorgon’s awareness and permission. It remains to be seen what exactly Panacea is up to here and whether or not she will eventually be able to fully treat Gorgon and cure him of his paralysis. An artificial Inhuman who had been transformed into a ‘Hydro-Man’ by Dr. Hydro’s use of a specialized version of the Terrigen Mists (given to him by the renegade Inhuman, Phaeder). Gremlin possessed fish-like features also with enhanced strength and the capacity to breath under water. He battled the Sub-Mariner alongside Dr, Hydro and his current status and whereabouts remain unknown. Dinesh Deol, a young engineering student living in Mumbai when the Terrigen Cloud passed over India. A latent Inhuman, Dinesh’s Terrigenesis was triggered by exposure to the cloud. Dinesh emerged from his cocoon quite quickly. 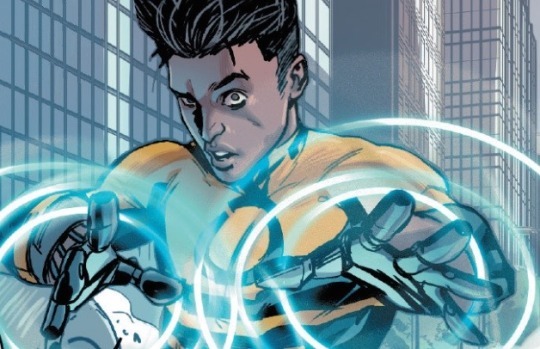 Physically, he appeared the same save for the fact that his hands had disappeared, replaced by a glowing light that could emit radiating pulses of ring-shaped energy.These energy rings enables Dinesh a moderate degree of control over electromagnetism, allowing him to control and manipulate objects containing metal. He is additionally able to perceive the electromagnetic spectrum, see the world through a myriad of frequencies of electromagnetic radiation. Viewing the world in the ultra high frequency of micro and radio waves made everything appear as though laid out on an intricate grid. For this reason, Dinesh ultimately chose the name ‘Grid’ and his new Inhuman title. Prior to his transformation, Dinesh had come to downtown Mumbai to see a movie premiere and hopefully catch a glimpse of one of his favorite actors, Aja Roy. Roy was also a latent Inhuman and he too endured Terrigenesis. Roy was transformed into a giant anthropomorphic, tree-like creature. Roy was horrified by what had happened to him and he went on a rampage. Dinesh tried to stop him, but both were attacked by agents of Hydra (who were seeking to abduct NuHumans in order to find a means of weaponizing them). Dinesh was saved by Medusa and her new team of Uncanny Inhumans, who arrived just in time to defeat the Hydra agents. The fellow NuHuman, Naja, befriended Dinesh and offered to help him learn to manage his new powers and abilities. Grid was soon thereafter recruited by Crystal to act as a member of her ambassadorial team aboard the Royal Inhuman Vehicle (RIV). Grid has continued to train with Gorgon to better learn to use his powers. The full extent and upper limits of Grid’s abilities has yet to be revealed, but considering that electromagnetism is one of the key sources of energy in the universe, it is possible that Grid is vastly powerful. Grid is an exceptionally bright young man and his education in engineering coupled with his ability to perceive the electromagnetic spectrum has aided him in becoming a gifted scientific thinker. He was even invited to join the prestigious Parker Industries and a head researcher. He is additionally a very compassionate individual who feel quite strongly about the sanctity of human life. This has caused a good deal of friction between Grid and his teammate, Panacea. Terrigenesis has in some way disabled Panacea’s sense of emotionality and she has come to look at the matters of life and death in a very cold fashion. Grid finds this very unsettling and he has questioned Panacea’s suitability as a field agent. More recently, an adventure brought the team back to India. Grind had an adventure there and it left he feeling that his abilities are more needed in his home city of Mumbai. He left Crystal’s team stating that they should feel free to contact him whenever his aid might be needed. One of Maelstrom’s minions, Gronk is actually a clone of a human exposed to the mutagenic properties of the Terrigen Mists. Gronk is a yellow-skinned behemoth with super strength. His skin exudes a powerful adhesive that causes objects to stick to him. He can control the effect of this adhesive and utilizes this ability in combat situations. Gronk invaded the scientific labs of Hydro-Base in an effort to steal a mutagen nullifying agent refined by Reed Richards. Gronk and his fellow minions battled The Thing of The Fantastic Four as well as the hero, Stingray. The two heroes won out and Gronk and his comrades were defeated and put in restraints. Upon learning of his minions’ failure, Maelstrom sent out his other servant, Deathurge, to silence them. Deathurge succeeded in his assignment and Gronk and the other minions were killed. As soon as Gronk died, a new clone was immediately created. Gronk has died in battle and been re-cloned on several occasions. His current whereabouts remain unknown. A latent Inhuman who was transformed by the Terrigen Cloud. Terrigenesis endowed Grove with the ability to project rainbow-like spectrums of hard light from his hands that he can manipulate like a whip. A former insurance salesman, Grove was recruited by Lash and brought to Orollan where Lash convinced him that Medusa represented an evil faction of the Inhuman populace who sought to exploit and rule over the others. Grove was easily manipulated by Lash and quickly became one of the villain’s most trusted followers. When Lineage tricked Medusa and a squad of Inhumans into a trap, Grove was among Lash’s strike force who attacked them. During the skirmish, Grove was shot by Nur and it appeared to be mortally wounded. It remains to be seen whether to not Grove survived. An Inhuman from the Marvel Cinematic Universe who has thus far only appeared in the television program, Agents of Shield. Joey is a new Inhuman whose transformation was caused by exposure to traces of Terrigen that had made its way into omega three fish oil supplements. Prior to this transformation, Joey had been a contractor who had decided to try to take better care of himself after a breakup with his longtime boyfriend. Following his transformation, Joey discovered he had the ability to instantly dissolve or melt any metal-based substance in his immediate vicinity. At first, Joey had an extremely difficult time controlling his newfound powers, which led him to cause a number of accidents. The ATCU had been recently formed to discover and apprehend new Inhumans and the organization was quickly alerted to Joey’s situation. Fortunately, the Agents of Shield were also on the look out for new Inhumans and Agent Daisy Johnson was able to rescue Joey before he could be taken or possibly killed by the ATCU. Joey was relocated to Shield’s base and held in a specialized apartment that temporarily nullified his powers. Agent Johnson and Dr. Garner helped Joey cope with what had happened to him as well as gain greater mastery over his powers. With much practice, Joey learned to control his powers and only dissolve metallic substances when he wanted to. Joey decided to join Agent Johnson’s team and help out his fellow Inhumans. Joey was finally cleared for filed duty for a mission to raid a Hydra base and rescue the Shiled agents, Fitz and Simons. Although quite scared, Joey proved his valor and was a central facet to the mission’s ultimate success. At one point during the mission, Joey threw himself in front of Johnson to protect her from enemy fire. His powers kicked in on a near unconscious level and he was able to melt the bullets before they hit his body. Although he had fought well and succeeded in the mission, Joey was quite shaken by the experience. He decided that day to day field work was not for him, but agreed to act as a member of Johnson’s ‘Secret Warriors’ squad for emergency missions. Joey’s character is portrayed by actor, Juan Pablo Raba.